As the mainstream moves onto pastures new, what does the future hold for this shadowy genre? Since 2011, PC gaming has been blessed with an incredible second wave of high-concept, high-budget immersive sims. Starting with Deus Ex: Human Revolution, the last few years have seen two Deus Ex games, two Dishonored games, a new Thief game, and Prey, which for all intents and purposes is a spiritual successor to System Shock. All of these games embrace the ideals that made Deus Ex, Thief and System Shock so striking in the ’90s—emergent play, player agency and complex level design—reforged with new aesthetics and exploring different ideas and themes. It’s been a wonderful ride, but that second wave is now coming to an end. Square Enix has shelved Deus Ex for the foreseeable future, and the less-than-stellar sales of both Dishonored 2 and Prey means the future of Bethesda’s immersive sims is currently uncertain. We shouldn’t be too sad—it’s remarkable that these games were made in the first place—but it does leave us with the question of what the future holds for the immersive sim. The short answer is that the future is hugely exciting. For the longer answer, we need to go right back to where the immersive sim began. OtherSide was forged out of the shards of Looking Glass Studios—the company that pioneered the very first immersive sims. Alongside Neurath, its employees include Tim Stellmarch, the lead designer on Thief, and Warren Spector. The studio is working on two games—System Shock 3 and Underworld Ascendant, the sequel to what was arguably the very first immersive sim. Yet despite appearances, OtherSide is not about rekindling the past. Rather, it is looking to continue Looking Glass’s ‘unfinished’ work. “We loved making those kinds of games, but then when Looking Glass ended prematurely, it cut off our ability to take those forward,” Neurath says. OtherSide wants to take the power of modern PCs and apply it to Ascendant at a systemic level. The result of this is what the team dubs the “Improvisation Engine”, a system whereby every object in the game is simulated according to a series of universal rules, handing the player the potential to solve in-game puzzles and problems in unique ways. Some of these potential solutions will be obvious and familiar to the player. Underworld Ascendant features the traditional fantasy trio of swordfighting, magic and stealth, and calls back to some the team’s earlier work, such as its highly Thief-like bow that shoots elemental arrows. But players can equally forego these systems and come up with solutions not intended by the developers. Neurath cites one example of a player who tried out the game at PAX East: “They went through the entire training mission and solved every single challenge and fought every single monster only by throwing apples,” he says. Having what is essentially a resurrected Looking Glass exploring these ideas once again is a remarkable thing in and of itself. But unlike in the ’90s, Neurath and company are no longer the only developers thinking about games in this way. Another studio looking to plumb the fullest depths of the immersive sim is Interdimensional Games, the studio behind Consortium and the upcoming Consortium: The Tower. The team has boldly declared the latter to be the “ultimate” immersive sim. The Tower puts players in the role of Bishop Six, an agent of the futuristic global police force known as the Consortium. The Tower kicks off where the last game left off, with the player parachuting onto a sprawling skyscraper complex overtaken by a terrorist organisation. Your goal is to rescue a group of hostages by landing on the tower, assessing the situation and determining the best solutions to the problems at hand. “The fundamental mandate of our whole company is about creating games that have a moral compass,” says Gregory McMartin, founder of Interdimensional Games. “So pushing the boundaries of interactive storytelling, while at the same time creating experiences that are very well balanced morally, and they take things seriously.” In Consortium: The Tower, this idea manifests itself in the form of consequences. Every action you take in the Tower will trigger a reaction that will alter the game state. As with most immersive sims, The Tower lets you sneak or shoot your way through most situations. But The Tower also allows you to talk to anyone in the game. Opening a dialogue with what McMartin refers to as the “potential combatants” can lead you to new missions, and result in bringing people over to the Consortium’s side. But where things get interesting is that this can also happen the other way around. As a pseudo-police force, indiscriminate killing is against the Consortium’s mandate, and if you’re a person who shoots firsts and asks questions later, you might be labelled as a rogue agent. It’s possible that McMartin’s plans will lead to the ultimate immersive sim. I don’t doubt his ambition. But I think—and McMartin agrees with this—that if The Consortium succeeds as he intends, it will be a one-off, an incredible, and in all likelihood unrepeatable anomaly. Hence, I also don’t think it’s where the future of the genre lies. 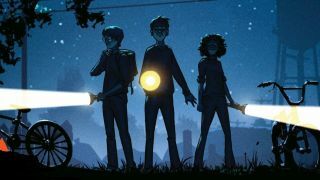 The Blackout Club casts players as a group of teens trying to unravel the mystery behind a force that’s manipulating the inhabitants of their hometown. Each night they embark upon procedurally generated missions, evading and confronting horrors, and delving ever deeper beneath the familiar streets of town into the strange and labyrinthine tunnels that run deep under their homes. In many ways The Blackout Club sets itself apart from immersive sim design. It’s multiplayer (although it can be played solo), and it employs randomisation to a far greater degree than most classical immersive sims. Your neighbourhood is a set place that you can learn the nooks and crannies of (“If there’s one thing immersive sims all share and we consider, if not holy then of divine importance to us, then it is setting as theme,” Thomas says). But your objectives are randomly generated, and aspects of the neighbourhood will move about each time you play, such as where vehicles are parked. At the same time, however, there are elements that are clearly inspired by the Looking Glass heritage, such as an emphasis on stealth, and using tools to distract, manipulate or overcome your enemies. The teens can prank call inhabitants under the spell of the malevolent force that controls them, forcing them to stop in place, or trick them into opening a door or taking out another enemy. But unlike traditional immersive sims, where the player is a single, all powerful entity, players will have to work together to stay alive. “In a lot of immersive sims in the past, people have their weapon hand and their magic hand, and by combining the properties of each of those, they were able to create novel effects or expressions. In this case, a lot of those sort of instruments in the orchestra are individual people,” says Thomas. In other words, one player is the weapon hand, while another is the magic hand. But there are other games also borrowing from immersive sim ideals but emerging from the opposite direction, where story content is prized above all. The Occupation is being developed by White Paper Games, creator of the narrative puzzler Ether One. It’s set in an alternate ’80s Britain that’s sliding towards authoritarianism, and sees you play a journalist investigating a bombing at a corporation that deals with immigration. One of the most interesting aspects of The Occupation is that its world runs autonomously of the player. The game takes place over a four-hour period, and after that the game ends. Even if the player sits and does nothing, things will still be happening within the game itself, and there will be an ending. “There is a way it’s going to go. But can you change it?” Bottomley asks. How you change that ending is through investigation, by sneaking into offices and other areas of the complex, collecting documents and reading their contents. As you do this, you’ll build up questions that you can ask other characters, and the more you dig around, the juicier those questions will be. But you can only do so much in those four hours, so you’ll have to prioritise where you go, who you speak to, and which questions you ask. For example, in the middle of the game there’s a meeting you’re scheduled to attend. You could simply go to that meeting at the allotted time and ask your standard questions, or you could dig around for evidence that you can use to catch your interviewees out. But there’s also a third way, which is that you don’t go to the meeting at all. All of those options will push the narrative in different directions. Whereas most narrative adventures revolve around set objects and scripted events, The Occupation is intended to be a constantly moving thing. Another key aspect of The Occupation’s evolution is the presence of onscreen characters—a rare sight in such narrative games due to how difficult they are to create with small teams. This, in turn, means that new systems, like sneaking, become a viable prospect. Indeed, stealth and getting caught in The Occupation is fascinating. Rather than being attacked as you would in Thief, the security guards of The Occupation will simply take you into a room, give you a telling off, and then increase the security in that area. But all of this will cost you time. “You can miss out on a timed event that was gonna happen. So say 15 minutes has passed, that thing that was going to happen in five minutes has already happened and you’ve missed it, so you have to find an alternative route. Which I think lends itself to the immersive sim genre,” Bottomley explains. It’s an exciting answer, and one that summarises where immersive sims are right now. We’re seeing developers pushing towards the same ideas from different angles. From veterans with unfinished business, to creators making their dream game, to developers like White Paper Games, who almost accidentally slid into the space from something entirely removed from the heritage of Looking Glass and Ion Storm.